Nobel Peace Prize winner Malala Yousafzai says she is excited to be home in Pakistan for the first time since the Taliban tried to kill her in 2012. She was just 14 when attackers got on her school bus in Swat Valley and shot her in the head. They wanted to stop her expanding campaign for the education of girls. Yousafzai spoke at her welcoming ceremony at Pakistan Prime Minister Shahid Khaqan Abbasi's office Thursday. She said she will continue to campaign for the education of girls. She also asked Pakistanis to be united on issues like health care and education. When she was attacked, Yousafzai was flown out of Pakistan to The United Arab Emirates and then to Britain, where she was treated. She has lived in that country since. She attends the University of Oxford. She told the gathering that it was hard to wait for more than five years to return home. Abbasi also spoke, praising Yousafzai for her sacrifices and defense of girls' education. He said he was happy to welcome her home, where, he said, terrorism has been defeated. 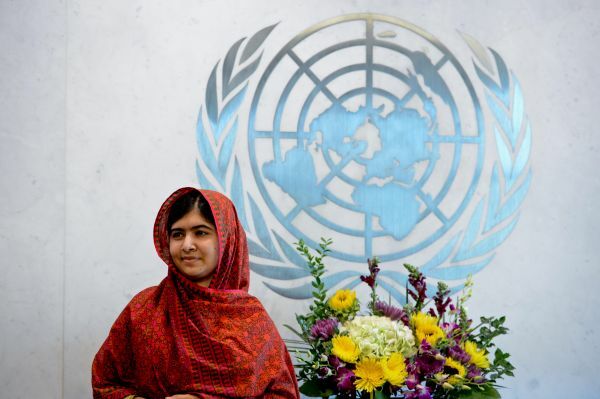 Since her attack and recovery, Yousafzai has led the "Malala Fund." She said it has invested $6 million in schools. "For the betterment of Pakistan, it is necessary to educate girls," she said. The 20-year-old university student and her parents are under heavy security. Yousafzai's return was kept secret. Many Pakistanis are welcoming her return. The party of politician and former sports star, Imran Khan, said her return was a sign of the defeat of terrorism in Pakistan. It is not clear if Yousafzai will travel to Mingora, her hometown in Swat Valley. A relative there, Mohammad Hassan said her return marked one of the happiest days of his life. Swat Valley school children made similar comments. 12-year-old Javeria Kahan said "I wish I could see her in Swat. I wish she had come here, but we welcome her." Marvi Memon, a top leader of the ruling Pakistan Muslim League party, also welcomed Yousafzai. She said it was a proud day for Pakistan. After she recovered, Yousafzai returned to campaigning for girls' education. She has spoken at the United Nations, established the Malala Fund, written a book, and taken other action to support the cause. In 2014 the Nobel Committee presented her with its highest honor, the Peace Prize. At home in Pakistan, some have criticized her, calling her a spokesman for the West. But Yousafzai argues that education is neither Western, nor Eastern. Often when she has spoken in public she has praised her home country and spoken in her native Pashto language. She has long promised to return to her home. Pakistani officials say they captured several people in connection with attack on Yousafzai. But the leader of the Taliban in Pakistan, Mullah Fazlullah, is still free. Officials believe he is hiding in neighboring Afghanistan. Children scampered off the yellow school bus and into the playground. 5.She has spoken at the United Nations, established the Malala Fund, written a book, and taken other action to support the cause. 6.Pakistani officials say they captured several people in connection with attack on Yousafzai. The police have taken him in for questioning in connection with the murder of a girl. A man is being questioned by police in connection with an attack on a disabled woman.